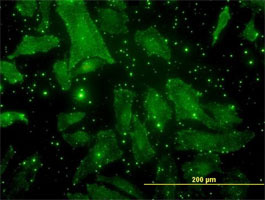 Immunofluorescence image showing osteocalcin expression in HeLa cells using Mouse anti Human osteocalcin antibody, clone 2D4 (MCA5225Z). Mouse anti Human osteocalcin antibody, clone 2D4 recognizes human osteocalcin, also known as bone gla protein or Gamma-carboxyglutamic acid-containing protein. Osteocalcin is a 49 amino acid ~5 kDa calcium-binding bone protein comprising ~1-2% total bone protein mass. Osteocalcin also has an additional 28 amino acid propeptide region along with a 23 amino acid signal peptide region. Recombinant protein corresponding to aa 52-100 of human osteocalcin. Kover, K. et al. (2011) Bone marrow cavity: a supportive environment for islet engraftment. Mizoshiri, N. et al. (2015) Transduction of Oct6 or Oct9 gene concomitant with Myc family gene induced osteoblast-like phenotypic conversion in normal human fibroblasts. Biochem Biophys Res Commun. 467 (4): 1110-6.